Opening the season at the University at Buffalo Blue and White Classic, the North Dakota State Bison volleyball team picked up one win in three matches. NDSU started quick in the first game of the season against Seton Hall, but the Pirates came back to win the match 3-1 (20-25, 25-14, 27-25, 25-20). The Bison created separation midway through the first set. A 9-2 run saw five attack errors by the Pirates as well as Seton Hall falling out of rotation. NDSU didn’t let the gap close to less than four before senior McKenzie Burke killed the opening game off. It was the Bison’s turn to struggle to hit. Seton Hall jumped out to a 9-1 lead in the set and never looked back. NDSU committed more errors than kills in the set. The third set was a contentious battle. Neither team could get on a run with the longest run of three for the Pirates. Alexis Bachmeier led the Bison with six kills in the set. The set was tied 17 times with nine lead changes. Burke tied the set at 25-25 to delay Seton Hall, but it was not enough. Seton Hall capped the match off in the fourth, but NDSU forced them to work. Consecutive kills by Bison sophomore Emily Halverson before a Buffalo attack error handed the Bison an 8-3 lead. A six-point run from Seton Hall gave them the lead that they would not concede. Burke registered 15 kills in the match to lead the Bison. The second game of the weekend allowed the Bison to drop the goose egg from the win column with a straight set win against Niagara University 3-0 (25-19, 25-22, 25-19). Kills by sophomore Bella Lien and Bachmeier on either end of a five-point run opened the gap for the Bison in the first set. With just a two-point lead, NDSU went off on a 7-0 run to make it 17-8. The Purple Eagles came back slightly, but Halverson killed off the set for the Bison. The second set was a tight affair with Niagara holding a slim lead early. Halverson continued to collect kills for the Bison and helped spark a pair of three-point runs and a four-point run in the middle of the set. A combination of Burke and Bachmeier kills on either side of an ace from redshirt freshman Paige Schaffer put away the set. Halverson was again the catalyst in the third, starting a 7-1 run for the Bison. Her career-high 13th kill of the game finished off the Purple Eagles. Bachmeier led the defensive efforts with a career-high 18 kills. NDSU closed out the tournament against Buffalo in similar fashion to how they opened it. 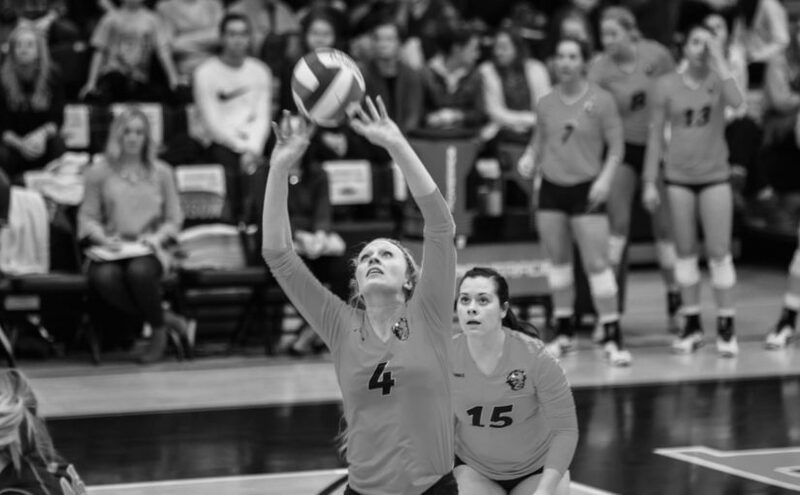 The Bison failed to capitalize on a quick start and fell 3-1 (22-25, 25-19, 25-21, 25-16). NDSU found offense from a variety of options in the first set. Halverson, sophomore Allie Mauch, Bachmeier and freshman Kalli Hegerle all registered kills for the Bison as they took the first set. An early 6-1 run for Buffalo was enough to shake off the Bison in the second set. A pair of aces by Schaffer brought the Bison within one at 6-7, but Buffalo slowly pulled away to even the match at one set apiece. Hegerle got the Bison off to a hot start in the third with a pair of kills to bookend a five-point run. Mauch extended the lead even further, starting a three-point run to make it 8-3. Buffalo got four kills during a five-point run to retake the lead. NDSU claimed the lead again with a four-point burst to make it 18-16. It would not be enough as Buffalo closed out the set with seven straight points. NDSU appeared to run out of gas in the fourth. A closely contested set in the early going was once again blown open with Buffalo again registering seven straight points to close out the match. Mauch and Bachmeier led the Bison with eight kills each in the match. The journey does not get easier for NDSU (1-2), as the Bison travel to Minneapolis for the Diet Coke Classic to take on No. 4 Minnesota, Arkansas and Georgia next weekend.